There are so many emotions I went through this past year so I didn't want to just leave with out mentioning the road to getting pregnant, especially since I have many other readers who have or are going through similar situations in their own paths to motherhood. This is such a hard topic, I have so many thoughts and feelings on it and I am not quite sure how to word everything right because they all seemed to be so scattered but I know I needed to write this post and not forget about those women who are still struggling. There is one thing I know: Motherhood is such a gift. It's a gift I wish no woman would take for granted. I am guilty, I did before and after Lexi. I was selfish I wanted babies to come on my timing.. 3 years apart to be exact. After the miscarriage month after month I was starting to realize everything happens on His time. I have NO control. I just have to take what life is going to give me. I felt it was important to be proactive in getting checked for any problems that could be preventing me from getting pregnant so after 9 months of not getting pregnant after the miscarriage I went to the doctor. Everything they checked for looked normal and I tried many extra things on the side -- no tricks/herbal medicine worked. It wasn't until this past February when I was able to have the surgery to see if my tubes could be blocked or to see if I could have scar tissue from my d&c - those were both fixable problems. I had high hopes for this surgery.. it was the only thing that made sense as to why I wasn't getting pregnant. After I got out of surgery as soon as I was conscious enough I remember asking Ty the results of what they found.. He told me everything looked good -- there was no blockage in my tubes and no scar tissue. Ty then proceeded to tell me but the Dr did say that the next 2-3 months would be the highest chances for conceiving because my tubes were flushed out. 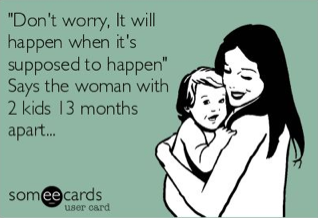 I didn't believe him, I didn't want to get my hopes up-- I had plenty of people tell me that same thing about getting pregnant after a miscarriage and that obviously didn't work out.. After being in bed for the next 2-3 days recuperating I had lots of time to think and I realized I finally had closure. I did my part.. I made sure on my end there was nothing more I could do to get pregnant. Luckily everything we tried prior wasn't for no reason.. it was either flushing out my tubes that did the trick or purely it was just time for us to have another baby.. either way I am entirely grateful that it all worked out! It's so easy to complain about all the hard things about pregnancy & motherhood and I think that is totally fine.. I just hope every single mom knows just how lucky they truly are for being able to bring a sweet spirit into this world. It's a gift that unfortunately not every woman has the opportunity to experience. If there is one thing I learned while not being able to get pregnant this past year..
Be grateful for that opportunity. We aren't promised anything in this world. I am not even promised this pregnancy to work out, but I sure hope it will. but how terribly shortsighted that is. before thanking God that there is rain? that we are pleased with our circumstances. we look beyond our present-day challenges. the more we realize that endings here in mortality are not endings at all. that one day will seem small compared to the eternal joy awaiting the faithful. there are no true endings, only everlasting beginnings. There are so so many women out there who are struggling with the fact they can't get pregnant, can't have babies anymore for whatever reason, or are struggling with a miscarriage. Privately or Publicly. women go through.. and I have gained a new found respect for each and every one of them. They all carry something so incredibly heavy. Miscarriages & Infertility (however long you tried) is emotionally challenging for any woman who truly wants to get pregnant. But for those who have to wait for long periods bitterness is bound to happen. Every new baby announcement feels like a slap in your face.. not that I wasn't proud and excited for each and every friend or stranger but it's just a constant reminder.. that it's just not happening for you. Feeling bitter can definitely get the best of you if you let it. 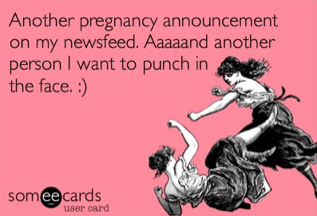 another pregnancy being announced every other day. Most of the time I just tried to count my blessings, look to other friends who have experienced something much much worse. You are not the only one in life going through something hard.. someone always has it harder than you do. the way you spend your life"
Just be thankful for the positive things in your life. unless it came from an actual doctor. Just be there to listen and let them vent. I cannot even begin to express how much the comments and e-mails have meant to me! who feel like friends rooting for us and truly happy for us! This is the one thing I love about blogging and the community that you find along the way!! Thank you from the bottom of my heart for being there to listen to me over the past year!! This post is full of many truths. I think that it's a beautiful thing to be reminded of the miracle and gift each conception is. It's something I had never fully comprehended until it didn't come easy. I'm so happy for you and your family as you grow in number! Blessings to you! I have so much admiration and respect for you, and this post really means a lot! Thank you so much for sharing your story AND for the beautiful reminder that God's plans and His timing are perfect. I feel very blessed to know you. You remain in my prayers as always! This was beautifully written. You are so blessed and I will pray for healthy pregnancy.. we're currently trying for baby #2 and I know how stressful it can be. All in HIS timing. So many women have walked in your shoes. How very brave of you to share this and share your struggles. It took us a while with our first and the way you wrote this really hit the nail on the head. Children and pregnancy are life's greatest gift. Thank you for sharing! 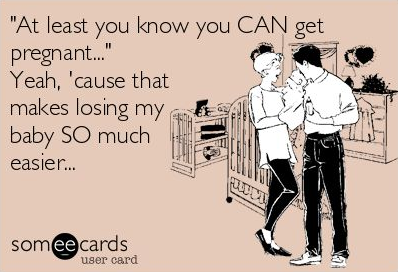 That last ecard is exactly what so many people told me after I suffered an ectopic and miscarriage. I swear people loss their mind a bit! I learned as I suffered so many others suffered with the right thing to say. Honestly, after losing a baby or 2 there is nothing any one can say that will make things better. The best things my friends did were to let me know they were there for me. Other than that nothing else really helped and it was their joy when I finally got pregnant and when our son was born this January that really made me believe they were there for everything; good and bad. Im very happy for you and your family!!! I just wanted to congratulate you on your news. I know how hard it is to wait and to wonder. This is a very exciting time for your family! Congratulations! I've been thinking this would happen soon for you! I've read your blog for a few years and now I'm pregnant as well with our first and due Nov 22nd!! Your post was very touching! You have such a kind heart. 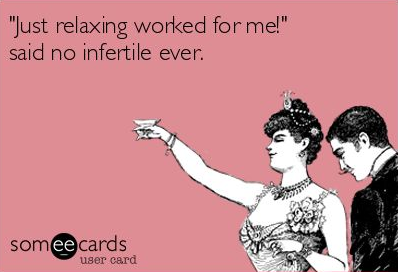 I struggled with infertility for four (felt like ages) years. It was a struggle with many ups and downs. The part that talked about the rain before the rainbow made sense! All of this is going to make your family "brighter". I will be praying for you! And, I forget how but stumbled across your blog a while back and love reading it!